Most of us have seen a tornado on the news and the Internet, but a vast majority of people have never personally witnessed the power and destruction of a twister. The U.S. averages about 1,300 tornadoes a year and Canada is ranked #2 in volume of tornadoes (averaging about 80 per year) with several high risk areas mostly in central provinces. Nearly 3/4 of the world’s tornadoes occur in the U.S. annually with a majority of them touching down in “tornado alley” across the central U. S.
But keep in mind tornadoes can occur anywhere in the U.S. — with sightings in all 50 states — and across every continent except Antarctica. even though the National Weather Service (formerly called the Weather Bureau) has been tracking storms since 1870 … they were not allowed to use the word tornado in its forecasts for fear of panic until 1950..?! 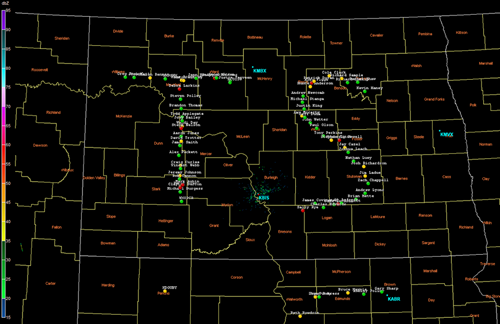 According to NOAA, 2004 had a record 1,817 tornado reports in the U.S. In 1974, during a 21-hour period, 148 tornadoes ripped through 13 states and 1 province between Alabama and Ontario, Canada killing 315 people. 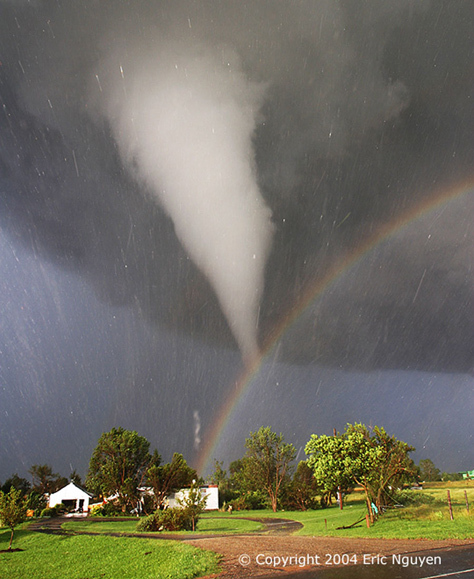 Tornadoes can last for several seconds or more than an hour, but most last less than 10 minutes. 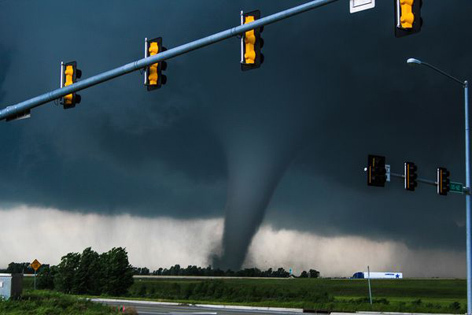 Peak tornado season in the southern states is March through May; in the northern states, it is late spring through early summer, but tornadoes can happen at any time of the year. 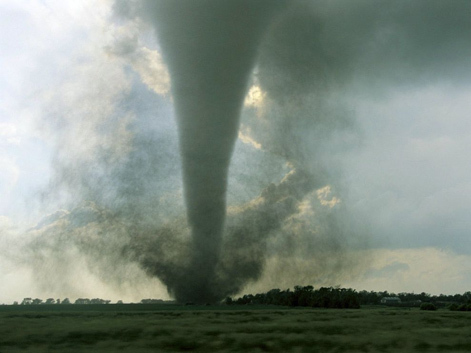 Also, tornadoes can also happen at any time of day or night, but most tornadoes occur between 4–9 p.m. 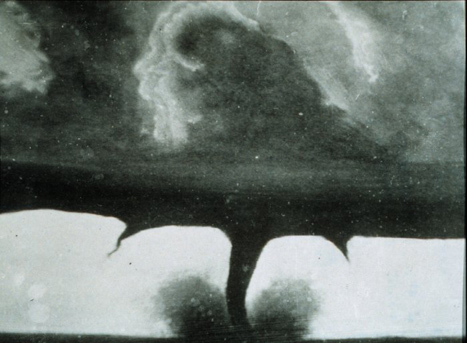 The 1925 Tri-State Tornado rode a straight-line path for 3.5 hours across 219 miles of Missouri, southern Illinois and Indiana, making it the longest single tornado track anywhere in the world. With a mile-wide diameter it looked wider than it was tall and caused 695 deaths — a U.S. record for a single tornado — and injured thousands. A waterspout is a tornado over water but isn’t recorded until it hits land. The force of a tornado can strip asphalt chunks off roads, rip clothes off people and pluck feathers off chickens. According to the National Severe Storms Laboratory tornadoes are rare and unpredictable, but NSSL admits experts don’t fully understand how tornadoes form. Basically a tornado is a narrow, violently rotating column of air that extends from the base of a thunderstorm to the ground. Because wind is invisible, it is hard to see a tornado unless it forms a condensation funnel made up of water droplets, dust and debris. 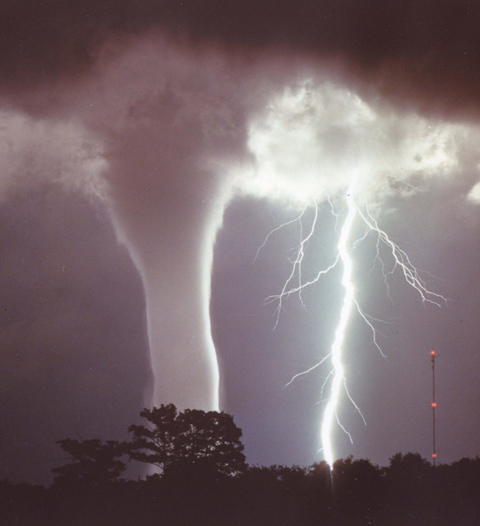 Tornadoes are the most violent of all atmospheric storms. 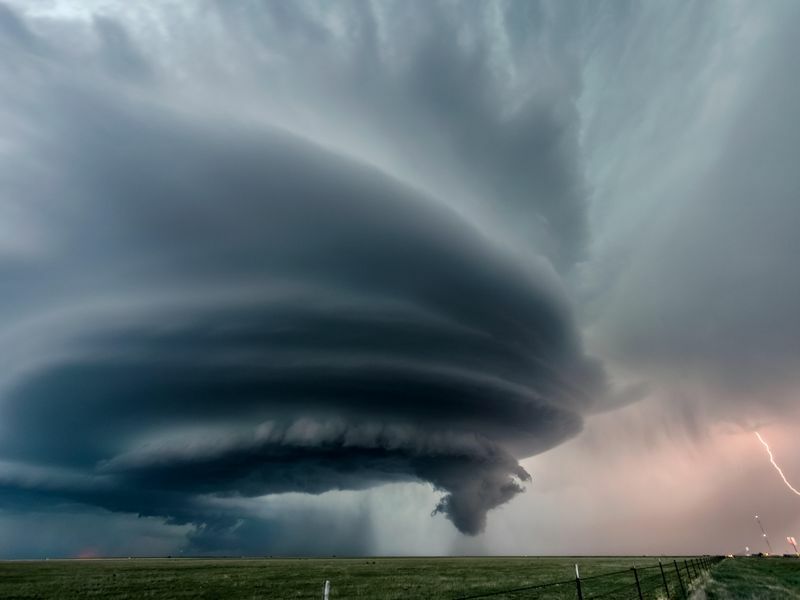 The most destructive and deadly tornadoes occur from supercells, which are rotating thunderstorms with a well-defined radar circulation called a mesocyclone. (Supercells can also produce damaging hail, severe non-tornadic winds, unusually frequent lightning, and flash floods.) Tornado formation is believed to be dictated mainly by things which happen on the storm scale, in and around the mesocyclone. Learn more in below 2 educational videos and scroll down to find some free safety information about tornadoes and other severe weather topics from our IT’S A DISASTER! book and other resources. FEMA’s Building Science Branch is hosting a one-hour webinar on Monday, May 22, 2017 at 2 p.m. EDT to provide consumer and construction guidance for residential and small business safe rooms. Participants will use the 2014 publication, “FEMA P-320 Taking Shelter from the Storm: Building a Safe Room for Your Home or Small Business,” as resource to learn about background on FEMA safe rooms, new guidance, and revised construction plans. Those interested in participating in the webinar can register online. and safe room tools and resources. The National Weather Service reported Tuesday that the killer tornado that struck near Oklahoma City last Friday was a ferocious EF5 twister, which had winds that neared 295 mph. 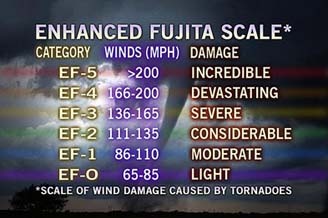 An EF5 tornado, the highest number on the “Enhanced Fujita Scale of Tornado Intensity,” is any tornado that has wind speeds of 200 mph or higher. This beats every world wind record except the more-than-300-mph reading measured during the Moore, Okla., tornado in 1999, according to AccuWeather meteorologist Jesse Ferrell. The weather service also said the twister’s 2.6-mile width is the widest ever recorded. According to the National Severe Storms Laboratory, the tornado blew up from 1 mile to 2.6 miles wide in a 30-second span. For perspective, Manhattan is 2.3 miles wide at its widest point. The tornado, which carved a path 16.2 miles long near El Reno, OK surpasses a 2.5-mile-wide F4 tornado that hit Hallam, Nebraska in 2004. 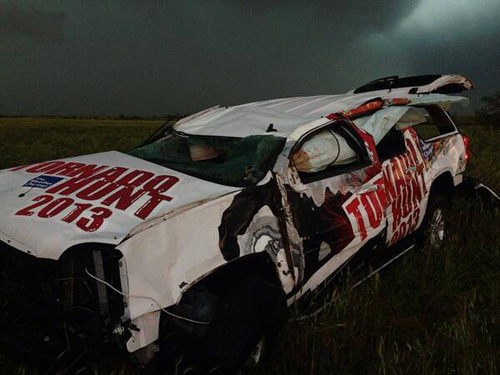 Sadly 3 veteran storm chasers were among the 18 people killed during the May 31st tornado outbreak in central Oklahoma. 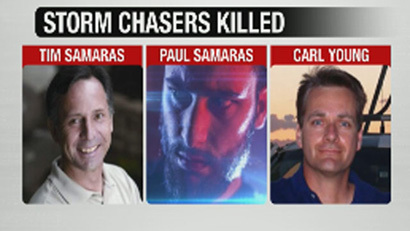 According to the Canadian County Sheriff’s Office, Tim Samaras, 55, his son Paul Samaras, 24, and Carl Young, 45, died while chasing a tornado in El Reno. Tim and Carl starred in the Discovery Channel series “Storm Chasers”. Below photo from G+ Sid Burgess shows the chaser community saying their goodbyes to Tim, Paul and Carl in chaser fashion. And earlier this week the Daily Oklahoman reported a 4th chaser perished in the El Reno storm: Richard Charles Henderson, an amateur chaser. From his pickup, amateur storm chaser Richard Charles Henderson took a cellphone photo of the first tornado Friday and excitedly sent it to a friend. Minutes later, that tornado would kill him. 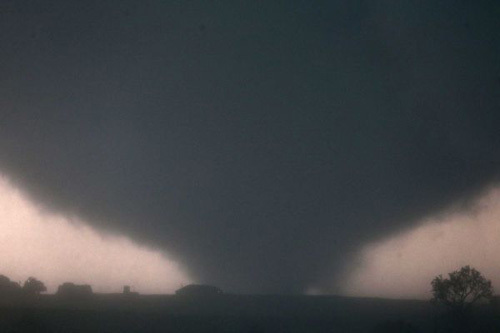 Tornadoes don’t usually happen in December … or do they? This past weekend the National Weather Service and others were forecasting wicked storms and tornadoes along the Gulf Coast for Christmas day, and sadly those predictions were spot on. Preliminary reports say 34 tornadoes touched down across Texas, Louisiana, Mississippi and Alabama during Tuesday’s outbreak although that total will probably be revised downward as duplicate reports are discovered. Actually … tornadoes happen in the U.S. year round. Most tornadoes obviously occur during the spring and early summer months, but December twisters are not as rare as people think. If you run your finger across the month of December, you’ll see a few wild variations. There were 99 tornadoes in Dec 2002 but only 1 in 2003 … and the 13-year average for December is 35 so tornadoes DO happen throughout the year and it’s just part of Mother Nature’s mood swings. When warm moist air in the south or southeast collides with winter cold fronts, bad things can happen. 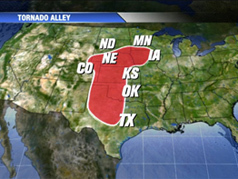 The U.S. has more tornado sightings than any other place in the world and averages about 1,300 tornadoes each year. The last time a number of tornadoes impacted the Gulf Coast area around Christmas Day was in 2009, when 22 tornadoes occurred during the morning of December 24th. According to the National Weather Service (NWS), at least one killer tornado has occurred during the month of December in 8 of the last 20 years. Over the entire official record, at least one killer tornado has been recorded in December almost every other year (27 out of 61 years). The highest recorded tornado occurred in 2004 over Rockwell Pass in California’s Sequoia National Park at about 12,000 to 12,500 feet. The most important thing to do year round wherever you live is to pay attention to forecasts, keep a NOAA Weather Radio handy when nasty weather is brewing, and learn what to do before, during and after various types of emergencies and disasters.